In the last few weeks I have focused on demonstrating, with examples, that water effectively removes material by penetrating into natural cracks in the material and causing them to grow. But what happens when there are not enough cracks to remove material at an economic rate? The modern approach has been to raise the pressure of the water so that smaller cracks grow faster, thus providing the production rates needed, but that option wasn’t available in the past. I mentioned last time that miners in the Caucasus Mountains of what is now Georgia used the power of mountain streams to erode gold deposits over 3,000 years ago. 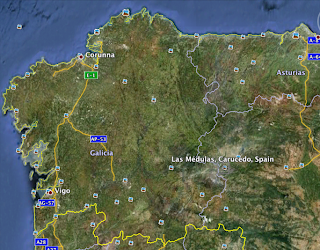 Perhaps learning from that, when the Romans came to Las Médulas in Spain, some 2,000 years ago, they though of water again as a way of mining the gold-bearing sandstone of the local hills. 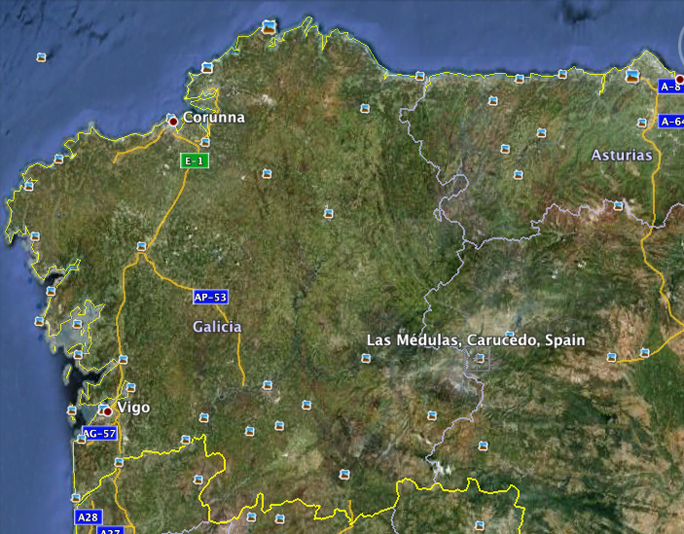 And though they had to modify the initial idea, the result became the most important gold mine in the Roman Empire. It is now a World Heritage Site. 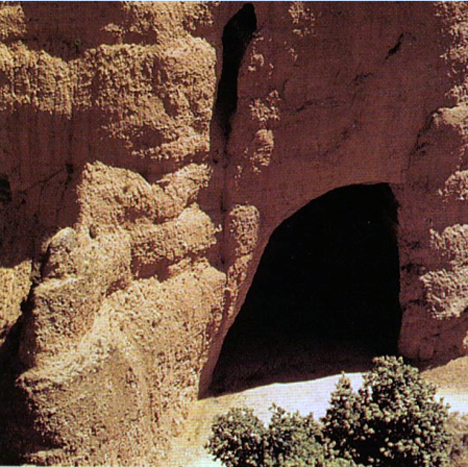 The sandstone was more resistant than soil, and so the Romans came up with two ideas to improve the rate at which the gold ore could be removed. The first idea was to run galleries into the sides of the hills, creating large chambers underground, with support for the roof from wooden supports that were left in place. Figure 2. 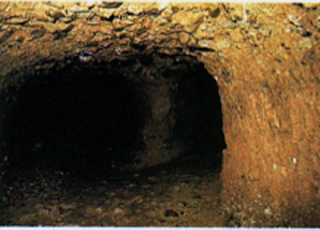 Tunnel driven into the bottom of the hill at Las Médulas. Figure 3. Underground room at Las Médulas. At the same time that the mining preparations were going on local streams were being diverted and dammed so that a large volume of water was held in reservoirs and then carried by manmade channels to a point over the mining chambers. With the water ready, the timbers were set on fire, which initially weakened the overlying rock so that it began to fail, falling into the opening, and as the support burned away more rock fell into the opening until the cavity worked its way up to the surface. At this point the reservoir gate was opened and water flooded down the channel to fall into the cavity. As the water fell it further broke the rock into grain-sized pieces, and carried these down and out through the original opening in the hillside. Figure 4. 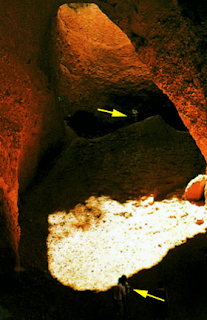 A Collapsed cavity, not the two figures at the arrows to get a sense of scale. Figure 5. 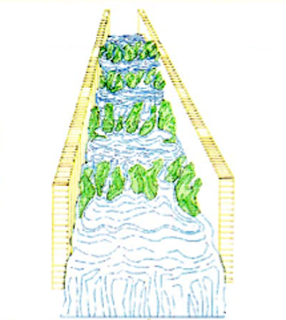 Artist sketch of the troughs used to capture the gold particles at the Spanish mines. The use of heat to weaken rock before using water pressure for cutting has been tried with a couple of interesting wrinkles both by researchers at Rolla, and at the then U.S. Bureau of Mines and in Colorado, among others. But those more modern trials will be described later in the series. Using water streams to erode surface outcrops of mineral survived as “hushing” in the North of England and elsewhere until fairly recently. Move forward some 1800 years or so from Roman Spain, and at the turn of the 19th Century miners in both Russia and New Zealand had a problem in mining coal. In both countries there were good quality coal seams, but they sloped at a steep angle that made it difficult to move men around without their slipping and falling. It was also difficult to support the roof, which was achieved at the time by sawing wooden props to length and wedging them between the roof and floor. Both nations had the idea of modifying the Roman idea of using water to remove the mined coal, but coal was thought to be somewhat stronger and more resistant than the Spanish sandstone. In the New Zealand case the mountainous countryside makes it expensive to drive roads and as early as 1891 wooden flumes were being used to carry coal to the consumer. However it was then realized that the water could be used to also remove the mined coal, particularly that which was left in regions of the mine where it was not safe for men to go. The coal was therefore initially blasted, and then the flow from the nearby streams was directed at the debris pile. The volume of water, and the slope of the mine combined to remove all the mined coal, often overnight, so that a new area could be worked the following day. It was not until 1947 that pumps began to be used to drive the water at greater pressures. At this point, with the higher pressures that pumping brought, it was no longer necessary to pre-crack and break the coal with explosives. While the New Zealand coal seams outcropped at the surface in very hilly ground, the situation was somewhat different in the Donets coal seams in the Soviet Union, where the seams were thinner, and production was barely economic. The seams in these mines were much deeper than in New Zealand, and so jet pressure could be provided from the drop in height from the mine surface to the location of the large nozzle or monitor that was used to aim the water flow at the coal. 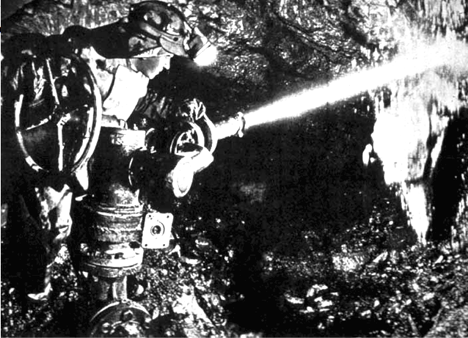 As with the New Zealand experience the Soviet miners (at the Tyrganskie-Uklony mine) initially blasted the coal with explosives to weaken it with a high density of cracks, before applying the water. However the miners found that not only did the water double production (to 600 tons/shift) the streams were powerful enough that it wasn’t necessary to pre-blast the coal. The nozzle diameters of the time were up to 2-inches in diameter, and could throw a jet up to 60 ft. It was from these small beginnings that hydraulic mining began, it was, in its time the most productive method of mining gold in California, and was used for many years around the world for mining coal, and other minerals. But that again is a subject for more detailed discussion at a later time. The combination of explosives and water power remains in use in harder rocks, particularly in South Africa in the gold mines. Here again the seams of gold are very narrow and can slope or dip at a steep grade, the working area is thus kept very cramped and difficult to work. By blasting the ore with explosive, it can again be moved with water pressure, although there is an additional advantage to water here that I will further explain when I write about cleaning rust from plates. Gold, as is shown by the way it can be collected in flumes, is very heavy, and part of the problem in the South African mines is that small pieces can get trapped in small pockets on the floor of the seam. The higher pressure water flows can flush out these pockets driving the gold particles down to a common collection point. In that particular the practices haven’t changed that much in three thousand years.